If you purchased Full, Extended, or Time Traveler Admission, you’re invited to attend our Live Events! These take place in real-time and attendees are encouraged to interact with the speaker by submitting questions or comments. 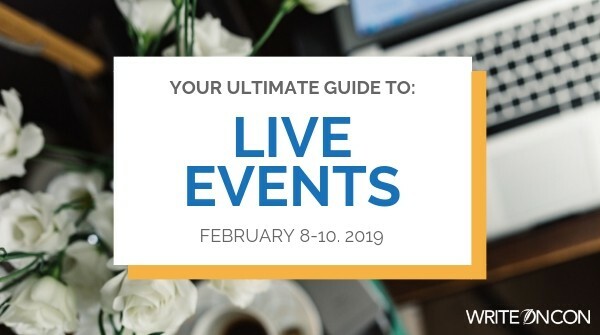 This Ultimate Guide will explain how to attend Live Events specifically; if you haven’t done so already, please check out our guide to accessing all events for general conference instructions. Live events are accessed through our Live Events page, or by direct links found on our schedule. Only Full, Extended, and Time Traveler Admission attendees will be able to access live events (though everyone can see the event previews). Attendees are encouraged to leave a question or comment for the speaker using the comments section on the event page. These will be collected by the event moderator and presented to the speaker; the moderator will filter out inappropriate content/language and may combine duplicate questions. You will need to be logged into your WriteOnCon account to see the full post and leave a comment. If you missed an event while it was live, don’t panic! All live events — both video and text — will be archived for you to be able to catch up on later (you just won’t have the opportunity to interact with our live speaker). The post for the event will go up 30 minutes before the event itself goes live. We invite attendees to arrive early and leave some questions to kick the event off. If you have the event page open, the live event should begin playing automatically. If it does not, please hit play and/or refresh the page as needed. Events will start promptly at their assigned times! Leave comments on the event page to ask your questions. The moderator for the event will be watching, ready pass them to the speaker. You’re welcome to ask as many questions as you’d like! At the end of the session (about 50 minutes after the start), the speaker will sign off and end the video. Some speakers may stick around to answer more questions in the comments, if they have the time available; however, many of our speakers are squeezing their event into a busy schedule and must vanish once their event is done. The video will remain up after the event is finished, and you can watch it at any time. If you missed an event live, you can visit the page later and the archived video will be embedded there for viewing. Comments left after the event may or may not be answered by the speaker. These events function much the same as Live Q&As, except that the speaker doesn’t present their information by streaming video. Rather, Live Blog Event speakers have prepared a blog post on the topic they wish to speak about. This blog post goes live promptly at the assigned event time. Speakers will be present for the 50 minutes following the start of the event and will answer all questions left in the comments section as they come in. Answers will be in the form of written replies left within the comments section itself. Speakers may also pop in again later in the conference to catch any late questions. These live events will be short lectures with interactive elements. They will usually begin with the speaker presenting material on the event topic, followed by an opportunity for attendees to try their hand at the elements just taught. Attendees will be invited to share their work with the speaker via the comments section of the event page; the speaker will offer feedback on some or all of the submitted work. Some speakers may choose to do one short talk followed by an extended work period, while other speakers may opt to break the lecture into sections interspersed with shorter work periods to focus on each element discussed. Questions are also encouraged. Some events may have special instructions for participation; in such cases the instructions will be posted on the workshop event’s page. These pages will go live 30 minutes before the event begins, so you have plenty of time to collect anything you might need, settle in, and be ready for the start of the event. Workshop events are live for 50 minutes total. This year, we’re hosting six live pitch events. Pitch submissions will be accepted for 24 hours, three days before the pitch event. Please see each event’s instructions for the exact submission window. We will be unable to accept late submissions. Submissions must be posted to the appropriate thread on our forums. You will need a forums account in order to post – please note that this is separate from your WriteOnCon.org account! Our forums are hosted by ProBoards for your security. Each event receives more pitches than the agent can possibly get through in her 50 minute window. In order to make the events fair for everybody, we will randomly select the pitches to be submitted to the agent. These will be provided to the agent in advance of the event. We will also post all of the selected pitches at the end of the agent’s submission thread for attendees to check whether theirs was selected. If a pitch is chosen for a particular event, it is disqualified from being selected in any other pitch events. This will allow all of our attendees to have a shot at being selected for a pitch event. However, since new submission threads will open before selections for previous events are announced, you are welcome to submit your pitch to multiple submission threads (we will keep track of whether it was already selected or not). Submissions that do not adhere to the agent’s guidelines (below, and also posted at the top of each thread) will be disqualified from that event. Agents will get through as many pitches as time allows. They will be going in the order that we present the pitches to them – this will be a random order, and will not reflect the time that the pitch was posted to the submission thread. Please have patience with the agents; we request your understanding if your pitch was near the end of the list and they ran out of time before getting to it. If an agent gets through all their selected pitches before the event time is up, they will go over any pitches left over from other events that ran out of time (if appropriate). If there are no leftover pitches, additional pitches will be randomly drawn by the moderator from the submission thread as necessary. For agents requesting query pitches, please provide only the body of your query – the full pitch and the summary/comp/word count paragraph. You do not need to include salutation or your bio. Special instructions: Alyssa has a particular interest in MG, both fiction and nonfiction, illustrated and non-illustrated. Special instructions: No PB or chapter books, please. So, that’s it! Simple enough? Email our help desk if you have any questions! I can’t go to vlogs or blogs. There are no instructions or links. I click to go to the event and it goes back to the same page.